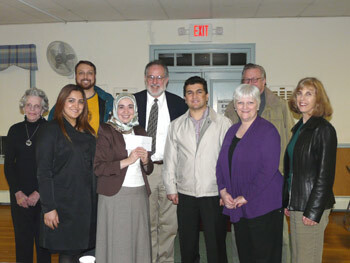 On Nov 3rd, First Presbyterian Church in Stirling, NJ hosted the program "Christian-Islam Dialogue". 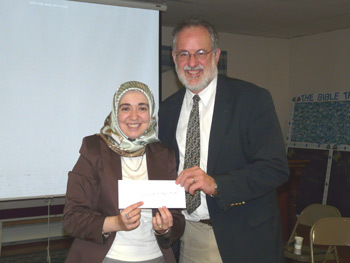 Dr. Nuray Yurt from the IDC was the guest speaker and gave the presentation "Islam in Brief". Dr. Yurt talked about pillars of Islam, six beliefs and misconceptions about Islam. Pastor Thomas joined conversation with his valuable comments. 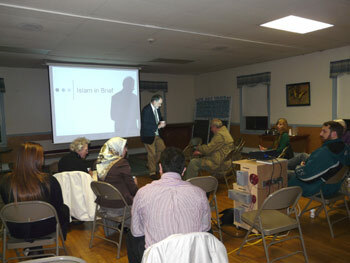 He has been giving lectures about the history of Islam, the Koran, and the fundamentals of Islamic faith at his church. After the presentation, Dr. Yurt answered the questions asked by attendees. The Program ended with the generous "peace offering" gift from dear friends at the First Presbyterian Church. Pastor Thomas presented the award to IDC for "Peace-Making Efforts". IDC extends his thanks to Pastor Thomas T. Peters, D. Min., for inviting the IDC to his church and for his efforts to promote inter-religious dialogue.